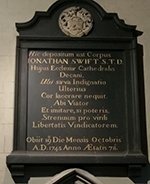 Jonathan Swift the Anglo-Irish satirist (known especially for Gulliver's Travels), essayist, political pamphleteer, poet, and cleric served as Dean of St. Patrick's Cathedral in Dublin, Ireland. Pictured below are his grave marker, a close-up of the epitaph he wrote for himself, and the location of the epitaph. William Butler Yeats offers a translation of the epitaph. *check online for early administration dates. Bolchazy-Carducci Publishers provides eTextbooks on a variety of eBook platforms. Bolchazy-Carducci textbooks are available through VitalSource, GooglePlay, Chegg, Copia, RedShelf, Adams Book, Follett, MBSDirect Digital, and ESCO. Each eBook platform offers a variety of tools to enhance the learning process. eBooks have the same content as our traditional books in print. Each fall, Bolchazy-Carducci mails its Roman Calendar to Latin teachers across the nation. If you're not on that mailing list, send a note TODAY to info@bolchazy.com. Put Roman Calendar in the subject line and provide us the USPS address to which you wish the calendar to be sent. The calendar is also available in a digital format. Visit the BCPublishers Blog for BCP news and information. Check out What Makes The Other Middle Ages an "Other" Text? As the holiday season looms large, all of us at Bolchazy-Carducci Publishers would like to take this opportunity to thank you for allowing us to serve you and your students. 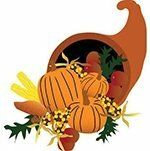 May your families and your students' families be blessed with a happy Thanksgiving. PS: While leading a tour of Ireland in September, with an eye on the look out for some interesting Latin, I took photographs of Jonathan Swift’s memorials. Check them out in this issue’s Classical Tidbits. Office Mix is a free add-in for Microsoft PowerPoint that allows users to add interactive features, narration, and annotations to a PowerPoint presentation. Once installed, a Mix toolbar appears in PowerPoint that makes it easy to add polls as well as multiple choice, true/false, and open-ended questions. I like being able to integrate quick little checks into a presentation. It is also quite straightforward to narrate slides and even annotate them during the narration. Once the PowerPoint is set up, the user can upload it to the Mix website and generate a link that makes distributing the presentation easy. Mix makes it simple to create content for flipping instruction or for making review materials. In my opinion, this is a tool for self-generation or self-paced activities for students. I’ve tended to assign them as homework rather than as in-class activities. When students access the Mixes that I have uploaded to the website, I have access to a useful set of data on that presentation. I can see their performance on the polls and questions as well as the amount of time they spent viewing and reviewing the materials. Check it out here. I have been a fan of author Colleen McCullough ever since I read The Thorn Birds, that powerful fictional account of a family living on a sheep station in the Australian outback. And so, I was taken with the idea of reading her novel about the women in Julius Caesar's life—this book would be an exciting tale set in Roman times and therefore would feed my interest in the classical world and at the same time indulge my desire to have a great read. Well, while it is a good book, it wasn't what I expected. The amount of detail was more than I wanted. And the title is quiet misleading. For example, over 100 pages (out of 852 pages) are devoted to Cicero: his role as senior council of Rome, his prosecution of Catiline, and his personal life. In this section, there is a fair amount of coverage of his wife Terentia but not much about Caesar and nothing about any of Caesar's women. To those interested in reading about Roman history, this book will be satisfying. Not only has McCullough written about Caesar, she also covers in depth, in addition to the coverage on Cicero and his wife Terentia, the lives of Publius Clodius, Brutus and his mother Servilia (Caesar's long-term lover), Pompey, and Crassus. The title of the book implies that some of the passages will be steamy and a couple of passages are, but they do not dominate the plot. The focus instead is on the political intrigues and military missions. In the political arena, it seems nothing was off the table. For example, when Nepos wants to make a case against Caesar, he rails against him for his alleged homosexual relationship with Nicomedes IV of Bithynia. (In response, Caesar makes plans to eradicate Nepos.) It appears that McCullough has done her research. I checked on some of the information in the book, and she had it right. I will confess that from time to time I skipped a few pages that contained detailed descriptions of a siege or political intrigue. McCullough makes clear the low status of Roman women throughout the novel. When Cato learned of his wife's infidelity (with Caesar, by the way), he divorced her, kept her dowry, and cast her out to live with her brother. She was not allowed to see her children again. When Servilia became pregnant with Caesar's child, she needed the cooperation of her husband in order not to suffer a similar fate. One woman who did have high status was Aurelia, Caesar's mother. But her status was dependent upon Caesar himself. Regarding the vestal virgins, their lives were truly prescribed. In order to preserve their chastity and to be sure their behavior was perceived as beyond reproach, they had no male visitors other than the Pontifex Maximus. Their doctors, carpenters, etc. were all women. For them, access to the outside world was restricted to one exit. Their enormous task was to keep track of wills of Romans and others (about a million in total). McCullough (employing literary license) paints Caesar as brilliant, handsome, and gifted. Other Romans do not fare so well with her. For example, she describes Cicero as conceited, immodest, and undisciplined (this last adjective might not be supported by classicists today). She quotes Caesar describing Cicero as ". . . a grasshopper with an undisciplined tongue." Brutus is described as a weak young man with a beard that to some extent hides his acne. Pompey the Great fares better in McCullough's words, but nonetheless, her description of him is not as appealing as her description of Caesar. In this novel, Pompey is described as needing to be liked. McCullough does not cover Caesar's affair with Cleopatra and the plot ends before Julia's death in childbirth and Caesar's assassination. It ends shortly after Caesar's marriage to Calpurnia. I recommend this book for those with a great interest in Caesar and Roman history. 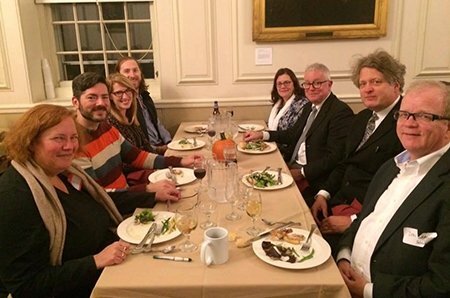 Over 150 classicists converged on The Heldrick Hotel in downtown New Brunswick, NJ, for the annual meeting of the Classical Association of Atlantic States held October 20–22. As is her custom, Executive Director Mary Brown carefully chose the delicious meals and arranged the meeting spaces. Don Sprague represented B-C. The exhibit room was located directly beside the refreshments kiosk and the registration desk, providing easy access for conference participants. The kiosk offerings from a rather robust set of breakfast offerings to sweets and savories in the afternoon were regularly replenished. These were definitely the best set of goodies ever encountered at a conference. Ken Kitchell's The Other Middle Ages, Ubi Fera Sunt, and the gods and goddesses coloring book that we are distributing caught attendees' attention. The Bolchazy-Carducci display was located directly opposite the entrance to the exhibit hall. CAAS traditionally draws a number of our authors and Don was able to chat and catch up with all of them except Jerry Clack. Those authors included Ronnie Ancona and David Murphy, coauthors of A Horace Workbook and Horace: A LEGAMUS Transitional Reader; Henry Bender, author of Catullus Expanded and Vergil: Image and Artist; Jerry Clack, author of three Greek texts including Dioscorides and Antipater of Sidon: The Poems; Judy Hallett, coauthor of A Roman Women Reader; John Starks, author of Latin Laughs: A Production of Plautus' Poenulus; and Linda Fabrizio, author of the Teacher's Guide and contributor to the student edition of Cicero: Pro Archia Poeta Oratio 3rd Edition. Congratulations to Michael Goyette, who teaches at Brooklyn College. 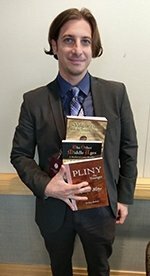 Michael won the CAAS book bundle drawing and took home several new B-C titles, including The Other Middle Ages, The Vulgate of Mark with the Synoptic Parallels, and Pliny the Younger: Selected Letters. Manning the book display consumed most of Don's time at the conference. He did, however, enjoy the presentations that accompanied the meals. In addition, he left the booth for 75 minutes on Friday afternoon to attend "Gathering Stories at the Edge of the World: Classics and Social Justice—A Performance by Rhodessa Jones and Members of the Medea Project: Theater for Incarcerated Women/HIV Circle." A prison counselor who was encouraged as a youth to read and who encountered Greek and Roman mythology as a child, Rhodessa immediately recognized the Medea story when an incarcerated woman explained that she had suffocated her child as a means of seeking revenge against her husband. And from that epiphany was born the Medea Project. A group of students from Gallatin School of individualized study at NYU and Rutgers joined Rhodessa and the two former inmates Angela Wilson and Cassandra Steptoe for a powerful set of movement interpretations of myth. That evening Don was honored to spend some time chatting with Rhodessa, Angela, and Cassandra about the Medea Project and their life experiences. Through The Medea Project, Cassandra, a survivor of incarceration, addiction, and abuse and herself living with HIV, helps women living with HIV to come to terms with their status, accept it as a disease, and with confidence share their status with others. Very powerful stuff! The poster promoting the special appearance of Rhodessa Jones and The Medea Project. 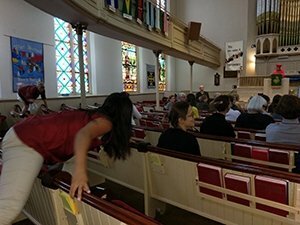 Participants in The Medea Project seized attendees’ interest as they ritualistically moved through New Brunswick’s United Methodist Church. 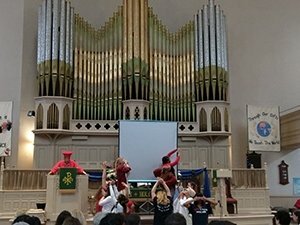 As Rhodessa Jones provided narration, Angela Wilson, Cassandra Steptoe, and the Gallatin School students used movement to illustrate the myths. Friday evening saw Ruby Blondell from the University of Washington giving the 2016 Clack Lecture: Helen of Troy Comes to Hollywood: Maria Corda as "The First Flapper Queen." Bolchazy-Carducci’s annual gift to CAAS helped underwrite the reception that precedes the Clack Lecture. Blondell's illustrated lecture was fascinating with its discussion of reception and the intersection of the classics, flappers, the Jazz Age, and art deco. Saturday's luncheon presentation showcased the incredibly talented Binghamton University duo of John Starks, Jr. and his student Santino De Angelo who shared two interdisciplinary projects. Starks discussed the production of The Ghoul Next Door: A Musical Roman Comedy (based on Plautus's Mostellaria) while De Angelo showed clips from a PBS filming of Narcissus: An Ancient Roman Pantomime. From the WSKG website: "WSKG Arts is proud to present Narcissus: An Ancient Roman Pantomime! This program is the culmination of a tremendous partnership between arts organizations from all across the state of New York. Featuring an original score composed by Binghamton native Santino De Angelo, performances by members of the Tri-Cities Opera and original choreography performed by pantomime dancer Doug Baum, Narcissus is a truly unique viewing experience. In addition to the three acts of performances, 'Narcissus: An Ancient Roman Pantomime' also features a behind the scenes look at the history of this long-forgotten art and how this complicated production came together." For other video material, see the Resources & Teaching Tips in this issue. At the annual meeting, CAAS takes great pride in honoring its members' contributions to the classics community with Ovationes and Laudationes. The group celebrated Edward Sacks of the Agnes Irwin School and past CAAS president Shelley Halley of Hamilton College with Ovationes. 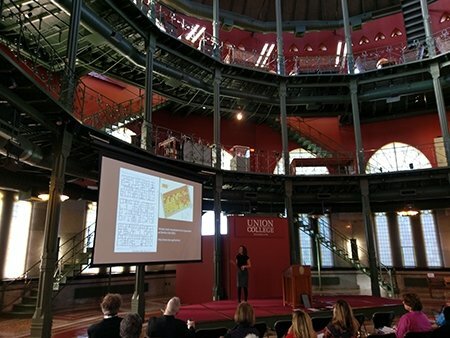 CAAS honored Sarah Pomeroy of The Graduate Center—City University of New York with a Laudatio. (As soon as these lovely Latin proclamations are available on the CAAS website, we will publish a link in the Kudos section of a future issue of eLitterae.) Witnessing these presentations is always an inspiring experience. Editor's Note: CAAS is blessed with an endowment whose earnings allow it to sponsor the Clack Lecture and to provide grants to help underwrite projects like those of Professor Starks and his protégé Santino De Angelo and to bring programs like The Medea Project to the annual meeting. 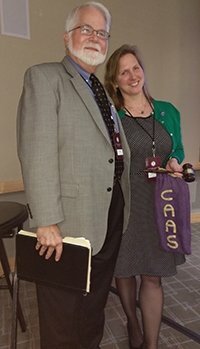 Having duly received the honored gavel from her predecessor interim president Lee Pearcy, Karin Suzadail smiles as the new president of CAAS. Bridget Dean, PhD, represented Bolchazy-Carducci at the 2016 biennial meeting of the Classical Association of the Middle West and South—Southern Section hosted by Emory University, October 27–28 in Atlanta, GA. The hotel location in Decatur was lovely with many restaurants within walking distance surrounding a fountain square and the DeKalb History Center Museum. The book display was directly behind registration and had coffee, a nice breakfast spread, and, in the afternoon, cookies to draw in attendees. All papers were delivered in nearby rooms. Congratulations to Caroline S. Kelly, who is retiring from teaching at Covenant Day School and Mitchell Community College in Carthage, NC. Caroline, a regular CAMWS-SS attendee, sold off her book collection at the meeting and donated the proceeds to CAMWS. Another exhibitor, the University of Georgia promoted their master's degree program for teachers. One of the students helping at the booth has started a group called "Multiculturalism, Race, and Ethnicity in Classics Consortium." The group's motto is Diogenes Laertes VI.63 "When asked from where he came, he said, 'I am a citizen of the world.' " Check out the group's Facebook page. Attendees enjoyed checking out books in real time and were especially interested in Latin for the New Millennium and our AP Latin titles. Longtime B-C friend David Bright, retired from the University of Illinois, stopped by and sent greetings to Marie. Herbert Benario, emeritus professor at Emory, also sent a friendly hello to Marie and chatted for a while on a variety of subjects. Anne Groton, coauthor of Thirty-eight Latin Stories, had a great deal to say about the new buttons—an illustration now accompanies the famous sayings. The buttons are a hit at St. Olaf College where the instructors promote classics majors using them. Ann noted that her students would like more Greek options in the future (B-C added five Greek buttons to the updated collection). Once again, the success of the CAMWS-SS meeting was thanks to the diligence and industry of the seemingly indefatigable Davina McClain. Kudos to Davina for another outstanding conference. The Classics Department at Baylor University in Waco, TX, hosted the annual meeting of the Texas Classical Association. Baylor regularly enjoys one of the largest undergraduate enrollments in Latin and Greek in the nation! Prolific author and veteran TCA participant Rose Williams represented Bolchazy-Carducci at the meeting. Rose proclaimed that the meeting was outstanding with its excellent presentations related to Greece, medieval studies, and comparative literature. Rose appreciated the opportunity to continue her discussions with Texas Latin teachers about the state's new proficiency-based learning standards. She noted that the conference offered an excellent presentation on the topic. She also noted that this year Texas teachers bought all the elementary readers (I Am Reading Latin series [four books and CD]; I Am Reading Latin Stories series [four books and songs in the B-C iPodius Agora]; Arbor Alma [The Giving Tree]; Shock-headed Peter; A Beginning Latin Christian Reader [no commentary or interpretation—just Scripture in Latin with vocabulary and other aids]; The Young Romans; and Ubi Fera Sunt) she had brought and they asked for more. Teachers find that these books seem to work well in increasing students' comprehension of and facility with the language. Bolchazy-Carducci thanks Rose for exhibiting the company's texts and to the Baylor host Dr. Simon Burris and his students for their help in ferrying the book shipment from place to place. 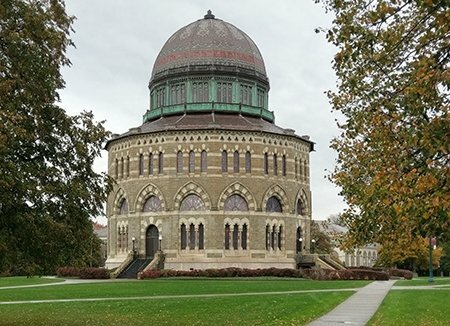 The Department of Classics at Union College and department chair Stacie Raucci hosted the 53rd Annual Institute of the Classical Association of the Empire State, October 28–29, in Schenectady, NY. Over fifty members assembled for an engaging set of presentations. Friday's presentation took place in Nott Memorial. Don Sprague represented Bolchazy-Carducci and set up the book display along the wall of this special building. Exhibiting in the same room as the papers afforded him the opportunity to listen to the afternoon's speakers. The exterior of Nott Memorial and the interior with Union College professor Angela Commito’s illustrated talk entitled "Teaching the Ancient Mediterranean Environment." The second upper levels of this unique building house a gallery. Friday evening's reception and banquet took place in the Hale House dining room whose walls are lined with historical portraits of various Union College notables. Bolchazy-Carducci sponsored a fine cheese spread that participants readily devoured. 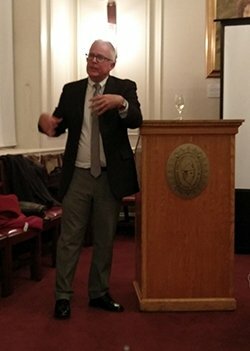 Professor W. Jeffrey Tatum of Victoria University of Wellington, New Zealand, delivered the keynote address, an engaging presentation entitled "Was Caesar a Weirdo?" Union College's Hans-Friedrich Mueller introduces his former professor at Florida State University Jeff Tatum, who now teaches in New Zealand. Note that Mueller is the author of B-C's Caesar: Selections from his Commentarii De Bello Gallico and Tatum authored the BC Latin Reader—A Caesar Reader: Selections from Bellum Gallicum and Bellum Civile, and from Caesar's Letters, Speeches, and Poetry. A distinguished group of banquet companions: left: Amy Vail, John Young, Sara Watkins, and Rich Tinkler; right: Don Sprague, Hans Mueller, a.k.a., Molinarius, Jeff Tatum, and Terri Mueller. Saturday's meetings took place in Karp Hall, a classroom, and meant again setting up the book display. Multas gratias Molinario! Professor Mueller kindly picked up the B-C book boxes from the mail center, stored the boxes, delivered the boxes to Nott Hall, brought them to Karp Hall, and ultimately with his wife Terri drove them to the UPS shipping center. He is certainly a gracious host! Saturday morning after set-up, Don was able to listen to David Pellegrino, coauthor of Caesar and Vergil AP Vocabulary Cards, present his diligent work in creating aids to reading Latin authors—"Reading Strategies: Scaffolding Caesar and Other Authors." 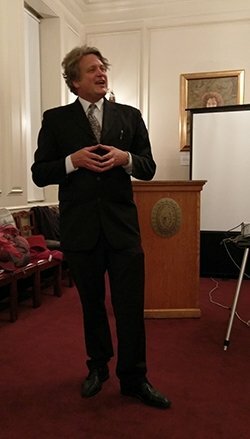 Professor Mueller gave a talk on Caesar entitled "From Salius to Augur: Julius Caesar’s Priestly Career." The CAES group proved once again to be very welcoming and friendly. CAES president John Mooney regularly announced before breaks a welcome charge—"Don't forget to check out Bolchazy!" 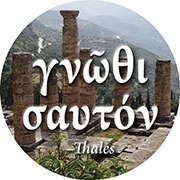 Editor's Note: Professor Tatum's presentation and participation in the CAES Institute was supported by a grant from the Classical Association of the Atlantic States. 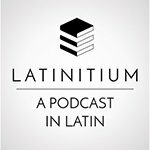 Latinitium is a podcast on various subjects, ranging from Halloween and Cicero's exile to particular expressions, literature, and tips for learning Latin. Each podcast is all in Latin. The difficulty varies with the subjects but overall they are pretty much kept to an intermediate level. Transcriptions make the podcasts more accessible. They're also available on iTunes. Latinitium is operated by Daniel Pettersson, MA, a longtime teacher and avid language learner, who is currently doing research and teaching Latin at Stockholm University in Sweden. For background information, see the CAAS Report in this issue. For a mini-lesson on Roman pantomime, share the following videos with your students—the televised production—and the story behind the production. Thanks to our colleague Rose Williams for this compendium of background information and Latin selections connecting today’s holidays with those of ancient Rome. For the holidays of the winter solstice, Rose gives a reading from Gellius and one about St. Nicholas of Myra. Feel free to make copies of these for classroom use. If you have not yet seen the new mosaics from ancient Zeugma, check this out. You'll love the mosaic of the muses. Learn how experts are digitizing ancient manuscripts for posterity and future scholarship. 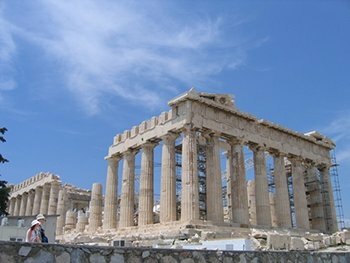 A three-quarters’ view of the Parthenon on the Acropolis in Athens. Photo Courtesy of Creative Commons 3.0, Attribution, I, Mywood. Talk about classical reception! An artist is building a Parthenon in Kassel, Germany, from banned books. Definitely, a fascinating use of this icon of Greek civilization. √ A Significant Tomb Exposed? Archaeologists expose what has long been considered the walls of Jesus's tomb. Please register by noon on Monday, November 28, webinar link will be sent on Monday afternoon. Professor Kitchell will provide an insider's, i.e., author's, perspective on the development of and rationale for his recently published The Other Middle Ages (Bolchazy-Carducci, 2016). He will share his insights on the utility of reading Medieval Latin and why it makes good sense to read this Latin with students who have just finished the basics. Students will find the grammar very manageable and many of the selections rather fun. Dr. Kitchell will present several representative readings to illustrate these points. ACTFL 2015 Teacher of the Year Ed Zarrow, PhD, joins active Latin master/enthusiast TJ Howell to give a webinar on using Roman coins in the active Latin classroom. Coming in early spring! Enter coupon code 48BC16 upon checkout. This offer is valid for 1 copy of each title, prepaid, no returns. Enter coupon code 48BC16 on the payment page. The special offer pricing will be charged at checkout.